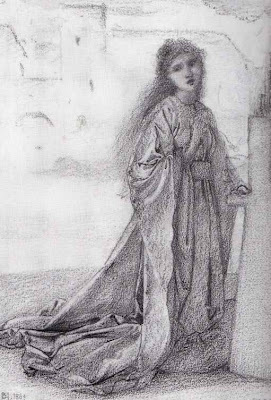 Of all the painters who formed the late nineteenth-century manifestation of Romantic Pre-Raphaelitism- a movement which owed much to te example of Edward Burne-Jones and more remotely to Dante Gabriel Rossetti- John Melhuish Strudwick is the most remarkable. Because he painted so slowly, and in such a meticulous style which he never attempted to adapt or simplify so as to be less technically exacting, he is represented by a small but precious corps of works. 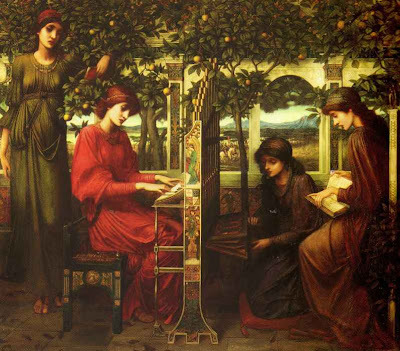 The painting which was exhibited at the New Gallery in 1901 as Summer Songs (and which in recent years has usually been known as Summer Hours), is one of the most celebrated of Strudwick's paintings and one that exemplifies the essential qualities of refinement and other-worldliness of his art. The subject shows four beautiful female figures in a garden or courtyard. 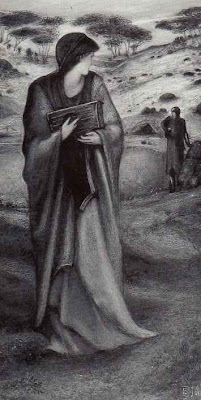 On the left stands the singer, holding a song-book. 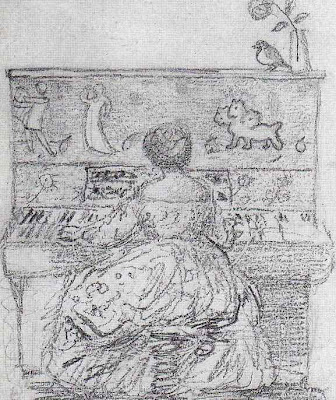 Beside her a girl is seated at an organ, the richly decorated side of which forms a vertical divide approximately at the centre of the composition. On the right is a kneeling figure, working the bellows of the organ. Seated at the side is a figure holding a book. 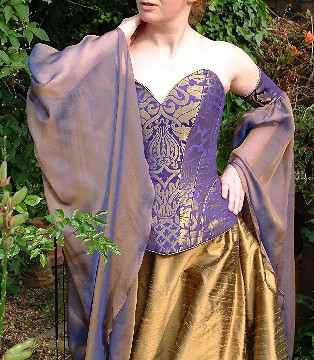 All of the girls are wearing long flowing dresses of rich but sombre colours, while each has her hair tied back with lengths of cloth, or in one case a golden chain. Behind the figures there is an arcade, with pairs of arches separated by pilasters decorated with relief patterns in blue and gold. Below the arcade’s sill, on the surface of the wall, is a painted decoration showing figures against a gold ground. On the entablature of the arcade is an inscription, the words masked by the golden fruit, leaves and branches. Through the spaces of the arches is glimpsed a wide Mediterranean landscape, with distant mountains and a line of umbrella pines. A group of three mounted knights, wearing armour and carrying pennants, are seen in the distance, but whether they are approaching the four maidens or are riding past on an unknown martial mission is not explained. Summer Songs is without any ostensible subject, and is therefore a characteristic product of the English Aesthetic movement in the course of which since the 1860s painters had freed themselves from the need to paint subjects which might be interpreted or understood in narrative terms. Summer Songs has within it two central themes of Aestheticism, each of which conveys a sense of mood to the work and captures the imagination. The first is an allusion to a season of the year. The luxuriance of growth, the warmth of colour, and the sense of heat, in the painting convey subliminally a feeling of summer as well perhaps of experience of the south. The second theme, allied to the first in the painting's title, is that of music. 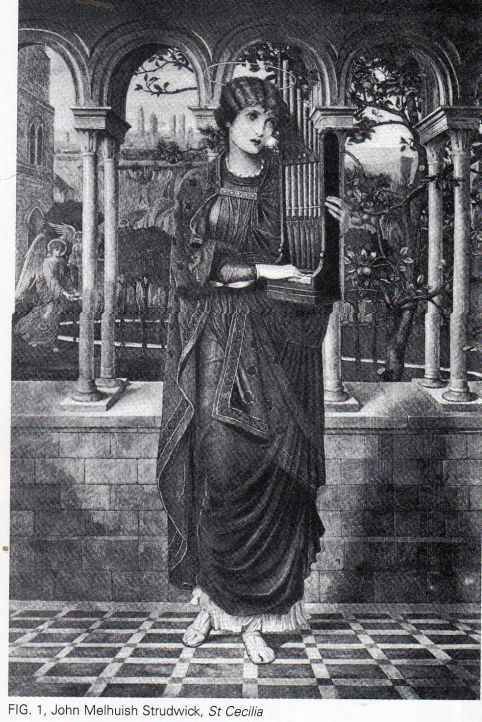 The work follows in line of succession to various St Cecilia subjects that Strudwick produced in the late 1890s (figs 1. & 2.). 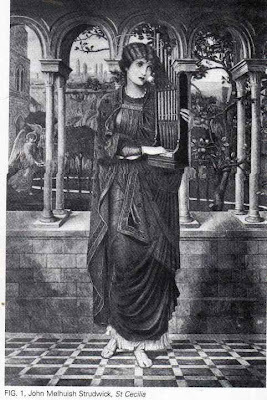 That now at the Walker Art Gallery in Liverpool shows St Cecilia, with a companion saint, and with her hands resting on the keys of the organ, and also features an arcade and distant landscape view of the type which is elaborated in Summer Songs. A larger and more complex work entitled Evensong (private collection), exhibited at the New Gallery in 1898, anticipates even more closely the present work, with four principal figures and with the richly decoated organ seen side on and with its keyboard in an obliquely-angled perspective. 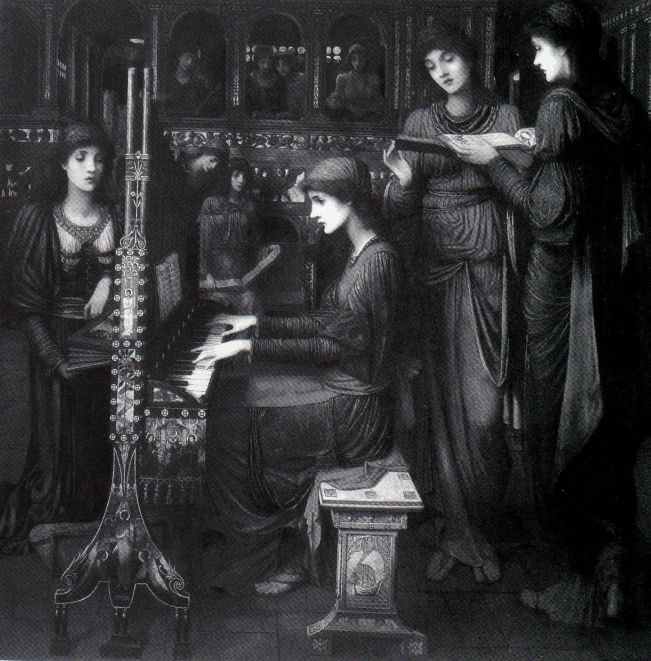 As John Christian has written, 'Like Burne-Jones, Strudwick loved to paint compositions in which a mood of wistful sadness is evoked by a group of female figures playing musical instruments' (The Last Romantics- The Romantic Tradition in British Art- Burne Jones to Stanley Spencer, exhibition catalogue, London, 1989 (under the discussion of Strudwick's 1897 St Cecilia), p.94). The two themes of Summer Songs – the season of the year and music – are allegorically linked. Each represents an imagined continuum, from which the figures will emerge in a transformed condition. The ripeness of the fruit that hangs in the branches overhead, and the scattering of dead leaves on the pavement, are reminders that summer must give way to autumn and that the effulgent bounty of one season will be succeeded by the bleakness of another. The cycle of the seasons are therefore here intended to remind the spectator of the phases of life itself. Similarly, the attention that a player or an audience might give to a piece of music, as represented in the playing of the figures, is intended as a metaphor of the span of life. 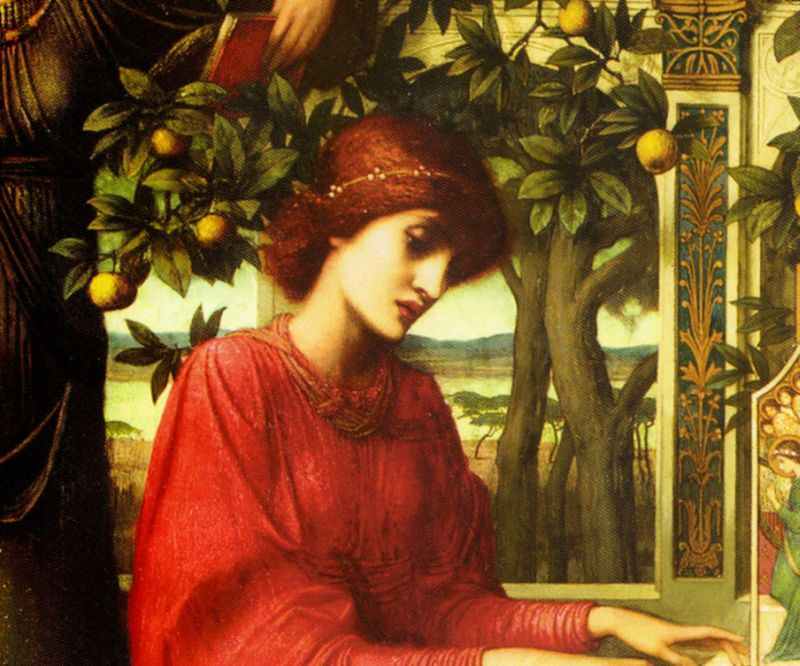 Thus, Strudwick’s paintings are meditations upon the passage of life and the inevitability of death, cloaked in a guise remote from mundane experience. 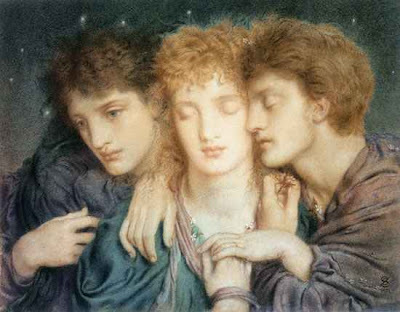 The pattern of Strudwick’s own career as an artist is intriguing. 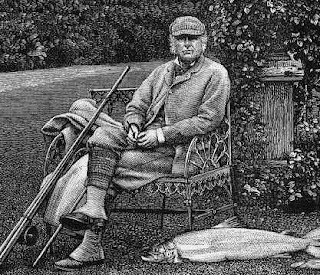 Although biographical details are few, it seems that he was not a man who relished public exhibitions or sought the kind of popular fame which might lead to further commissions or flattering reviews. Having trained at the South Kensington school and then at the Royal Academy, he commenced his professional career by painting in a fairly conventional style derived from the example of John Pettie (1839-1893). 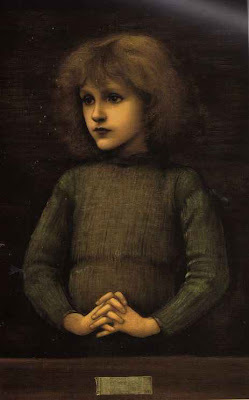 A crucial formative experience in his move towards a style of art of technical refinement and aesthetic subtlety occurred in the early 1870s when he was employed as a studio assistant first by John Roddam Spencer Stanhope and then by Burne-Jones. 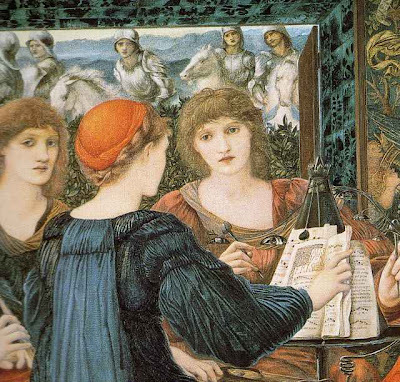 Strudwick’s works were repeatedly rejected by the Royal Academy and his professional prospects were uncertain. 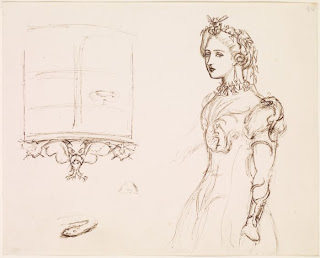 However, in 1876 his painting Song without Words (Sotheby's, London, 8 June 1993, lot 22) did gain admission (it was in fact his only contribution to the Royal Academy summer exhibitions in his entire career). The work caused a great stir among those who were curious to know how such a quaint and yet technically demanding work could have been undertaken by an otherwise unheard of artist. 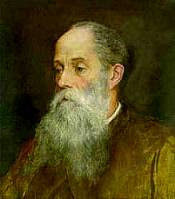 According to George Bernard Shaw, who wrote the article about Strudwick which is the principal source of information about the artist, the sale of Song without Words marked the critical turning-point in the painter’s fortunes. 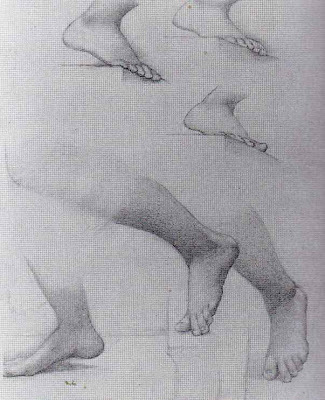 He ‘promptly hired a studio for himself; and since that time his vocation as an artist has never been challenged. There is no such thing as an unsold picture by Strudwick; and so the story of his early struggles may be said to end there’ (‘J.M. 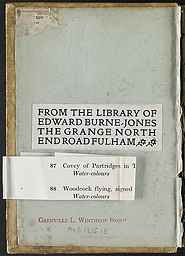 Strudwick’, Art Journal, 1891, pp.97-101). From this time forward Strudwick gained a following among a circle of collectors and connoisseurs who appreciated the complexity and intensity of a style of art that was alien to the gaudy and mechanical confections so often seen in the public exhibitions. Two Liverpool collectors – William Imrie and George Holt – were his most loyal supporters. 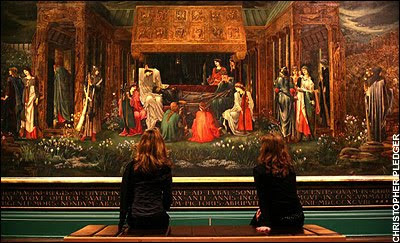 In reply to the accusation that Strudwick was merely an imitator of an historical style of painting, Shaw wrote: ‘There is nothing of the fourteenth century about his work except that depth of feeling and passion for beauty which are common property to all who are fortunate enough to inherit them’. Strudwick’s art made great demands both upon the artist and the spectator, and for this reason he remained outside the artistic establishment of the day. 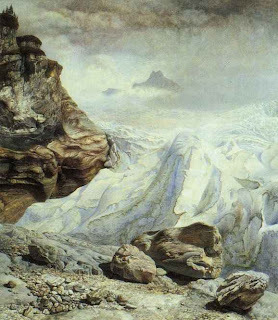 His paintings are, nonetheless, highly sophisticated expressions of an anti-Utilitarian counter-culture in the late Victorian world, and were esteemed for their complete indifference to all that was modern, or indeed distinctly of any age. 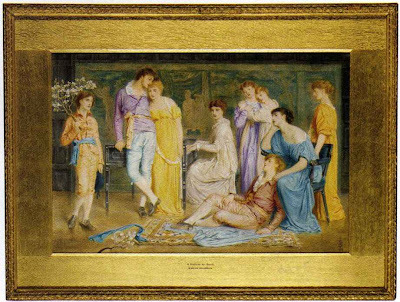 Summer Songs belonged to the Birkenhead patron and collector Joseph Beausire, presumably having been bought by him at the New Gallery in 1901, and once again demonstrating the particular enthusiasm that was felt for Strudwick’s work by the great merchant patrons of the north-west. Beausire had set up a trading company which operated between Liverpool and the West Indies and Latin America, and was chairman of the West India and Pacific Steamship Company. 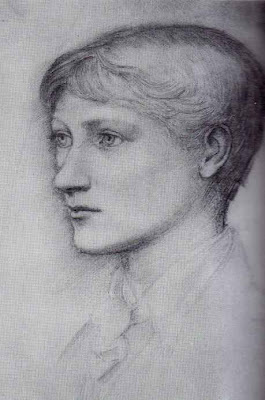 Although Beausire died in 1907, it was not until 1934 that the main body of his collection was sold, with works by Rossetti, Burne-Jones, Sandys and Poynter, as well as landscapes by Turner, Constable and Cotman, and works by members of the Liverpool School being represented. 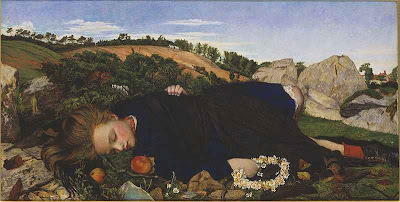 In 1970 C. F. J. Beausire made a bequest of watercolours from the Beausire family collection to the Walker Art Gallery in Liverpool. 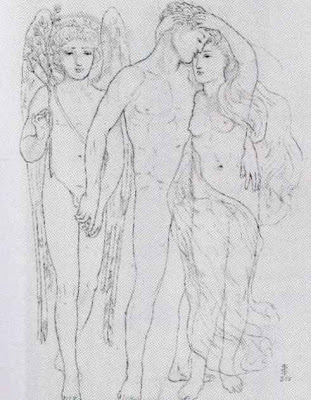 Exhibited at the Dudley Gallery in 1896 when the artist was 28. 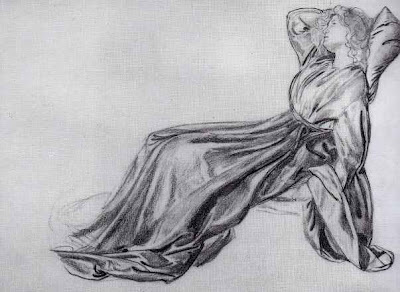 It was exhibited at the RA in 1906 (a year after his death). I hadn't seen the frame before. Sleeping Beauty tile panel, designed by Edward Burne-Jones for Morris, Marshall, Faulkner & Co. Earthenware. England, 1860s. 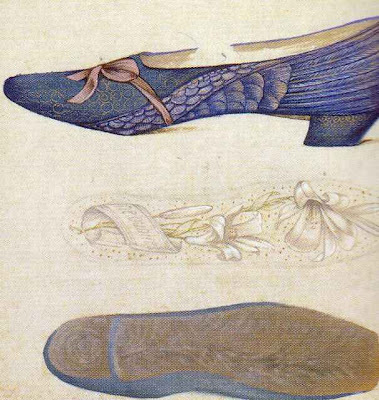 "Useful & Beautiful: The Transatlantic Arts of William Morris and the Pre-Raphaelites"
"Useful and Beautiful: The Transatlantic Arts of William Morris and the Pre-Raphaelites" will be the subject of a conference and related exhibitions to be held 7-9 October 2010 at the University of Delaware (Newark, DE) and at the Delaware Art Museum and the Winterthur Museum and Country Estate (Wilmington, DE). Organized with the assistance of the William Morris Society, "Useful and Beautiful" will highlight the strengths of the University of Delaware's rare books, art, and manuscripts collections; Winterthur's important holdings in American decorative arts; and the Delaware Art Museum's superlative Pre-Raphaelite collection (the largest outside Britain). 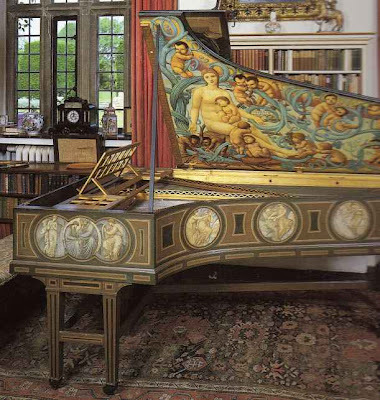 All events will focus on the multitude of transatlantic exchanges that involved Morris, the Pre-Raphaelites, and the Arts and Crafts and Aesthetic movements of the late nineteenth century. 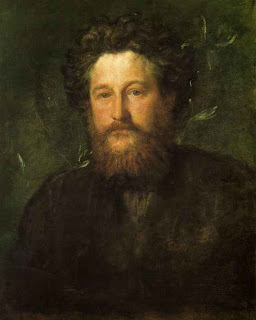 We seek 250- to 500-word proposals for short papers (15 minutes reading time, maximum) that explore relationships and influences--whether personal, intellectual, political, or aesthetic--connecting William Morris, his friends, associates, and followers in Britain and Europe with their contemporaries and successors in the Americas. 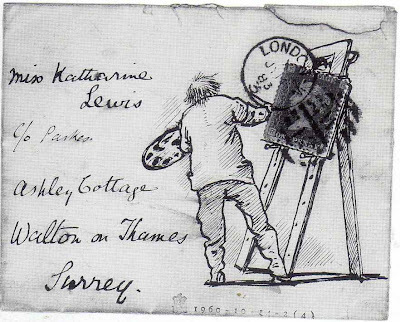 The "arts" will include not merely those at which Morris himself excelled--i.e., literature, design, and printing--but also painting, illustration, architecture, performance, and anything related to print culture in general. Papers that examine transatlantic politics, social movements, and environmental issues in light of Morrisian, Pre-Raphaelite, and Arts and Crafts perspectives are also welcome. The deadline for 250- to 500-word proposals is 15 March 2010. Please forward electronic submissions to: Mark Samuels Lasner, marksl@udel.edu. 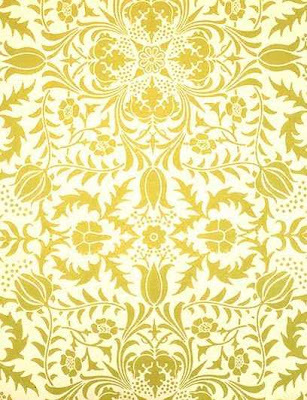 Limited funding may be available for speakers whose papers focus specifically on William Morris and who are in need of financial assistance. To be considered for support, explain your circumstances when submitting your paper proposal. In addition to conference sessions, there will be a keynote lecture, demonstrations by leading practitioners who make and design Arts and Crafts objects, special exhibitions, and related film, theater, and musical performances. The following exhibitions are anticipated at the time of the conference: Delaware Art Museum ("May Morris," also permanent display of the Samuel and Mary Bancroft Pre-Raphaelite collection); University of Delaware Library (American literature, 1870-1916 exhibition and "William Morris"); University Gallery, University of Delaware ("Ethel Reed: Transatlantic Artist of the 1890s"); Winterthur (Arts and Crafts archival resources); and Delaware Center for the Contemporary Arts ("David Mabb: The Morris Kitsch Archive"). For more information go to www.morrissociety.org or contact Mark Samuels Lasner, (302) 831-3250, marksl@udel.edu. 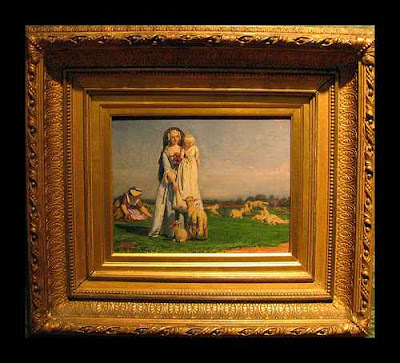 "Useful and Beautiful" is supported by the Delaware Art Museum, Winterthur Museum and Country Estate, the William Morris Society in the United States, the William Morris Society (UK), and the following University of Delaware departments and programs: College of Arts and Sciences, the University of Delaware Library, Art, Art Conservation, Art History, English, History, and Material Culture Studies. 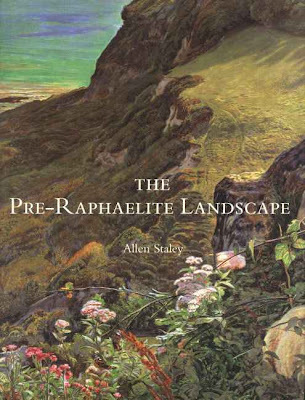 Each month a key work by one of the Pre-Raphaelites will go on display in the Gallery. 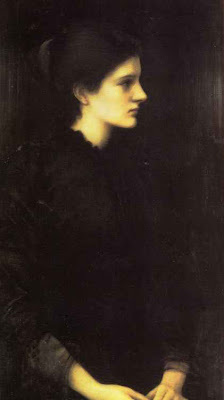 Currently on display is 'Portrait of Alexa Wilding' by Dante Gabriel Rossetti. This is a wonderful opportunity to view works which are not on permanent display. Son of Joseph Comyns Carr one of the managers of the Grosvenor Gallery and later the New Gallery where this was exhibited. 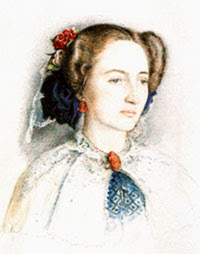 Daughter of his friend Mrs Helen Mary Gaskell. 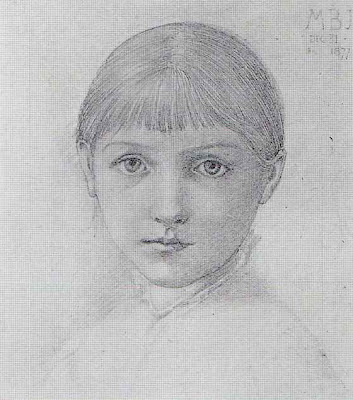 His beloved daughter, aged 12 in 1877. Apart from being a frequent model she used to read to her Father whilst he worked in his studio. 24 3/4 x 18 1/4"
Offered by Christie's in 2008 it is unfinished and last recorded by the same auction house in 1908, but seems to be otherwise unknown. A lovely portrait of the wife of Sir Charles Arthur Turner - a member of the Indian Judiciary - later Chief Justice in Madras. 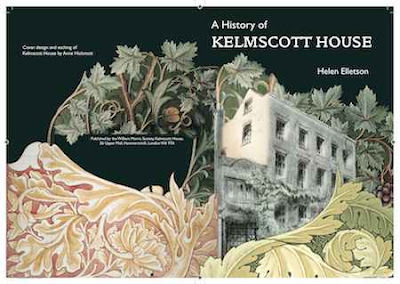 He married in 1866, Emily was from Wells in Somerset, daughter of William S. Hodgkinson who established a paper mill at Wookey Hole and who in 1887 commissioned Glencot House. A friend of Oscar Wilde and mistress of Maurice Barres - said to receive her admirers on a bed of Lilies. A noted author of her time and a leading Aesthete. 9 ¼ by 5 ½ in. Reproduced here for the first time and not exhibited publicly since the Dudley Gallery Winter Exhibition of 1879 Offerings is a fascinating rediscovery. A seminal work in Waterhouse’s oeuvre it marks a transition away from the continental Salon style of his early works such as The Tambourine Girl (Townley Hall Museum, Burnley), his first Royal Academy exhibit Sleep and His Half Brother Death (Sotheby’s New York, 11 December 2003, lot 71) and The Remorse of Nero after the Death of his Mother (private collection) exhibited in 1878 at the Dudley Gallery, Piccadilly. The paintings of the early 1870s had been influenced by the exhibits of the French academic painters particularly the grand classicism of Jean Leon Gerome. 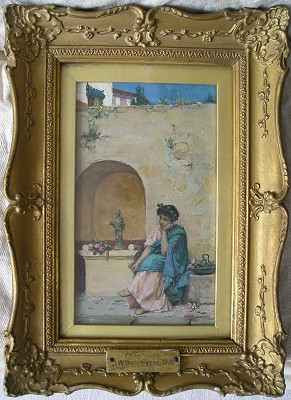 Offerings was the first of a series of pictures in which the influence of Lawrence Alma-Tadema replaced that of Gerome, a series of small paintings of everyday Roman life which includes Dolce Far Niente (Kirkaldy Museum and Art Gallery) and A Grecian Flower Market (Laing Art Gallery, Newcastle-Upon-Tyne) of 1880 and A Flower Market, Old Rome of 1886 (private collection). Waterhouse was still a student at the Royal Academy Schools when he painted Offerings a small panel of a young Pompeian or Roman girl dreaming of her beloved at a shrine devoted to Venus. Tadema was a regular visiting tutor at the Schools from 1877 onwards and clearly had a great influence upon the talented young student. Like Tadema, Waterhouse had been drawn to Pompeii and much influenced by his first visit there in 1876 when he made detailed watercolour studies of the frescoes and architecture. Waterhouse’s visit to Pompeii was to have a significant effect upon the series of small paintings depicting domestic classical subjects which were painted with a realism which echoes the work of the painters William Logsdail and Henry Woods with whom Waterhouse became associated around this time. Woods and Logsdail painted Venetian subjects of street vendors and hawkers and the only difference between Offerings and Logsdail and Woods contemporary work was the period in which they are set. 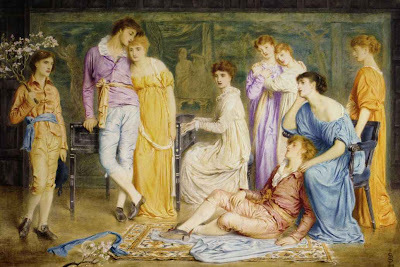 Like Woods, Logsdail and Tadema, Waterhouse painted romantic pictures which, although they were set in an ancient or foreign setting, could be understood by the nineteenth century audience. Unfortunately his interest in these domestic subjects was soon lost and he began to paint much grander subject paintings from classical mythology, history and literature, including Diogenes of 1882 (Art Gallery of New South Wales, Sydney), St Eulalia of 1885 (Tate Britain) and the famous Mariamne of 1887 (private collection). In the 1870s Waterhouse chose to exhibit his pictures at the Dudley Gallery housed in the flamboyant Egyptian Hall on Piccadilly. 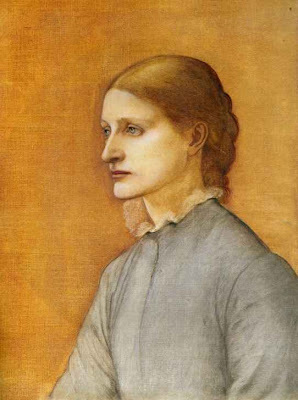 The Dudley Gallery was renowned as the predecessor of the Grosvenor Gallery, extolling the Aesthetic ideals of artists like Simeon Solomon, Walter Crane, Henry Holiday and Burne-Jones. The double handled iron bowl in Offerings was a prop from Waterhouse’s studio and appeared in several other pictures including Dolce Far Niente, Diogenes and A Flower Market, Old Rome which also includes a shrine containing the same bronze figure of Venus and possibly the same Italian model. The composition of Offerings was reinterpreted over a decade later in Waterhouse’s Flora (Sotheby’s New York, 20 April 2005, lot 96) and the subject of a young girl making flower offerings at a roadside shrine was depicted in at least two versions of Arranging Flowers c.1890 and a medieval variant The Shrine of 1895 (private collection). The subject of devotional sacrifice was also pictured in The Household Gods of 1880 (Christie’s, 4 November 1994, lot 100) which was part of the famous collection of Sir John Aird, and presumably also Sweet Offerings exhibited at the Liverpool Autumn Exhibition in 1882 (present whereabouts unknown). Offerings was the first of Waterhouse’s paintings of a subject which was to preoccupy him for many years.